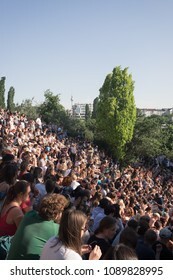 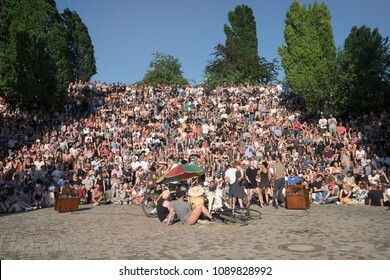 BERLIN, GERMANY - MAY 13, 2018: a large crowd watches open-air karaoke in the Mauerpark, in the Berlin district of Prenzlauer Berg. 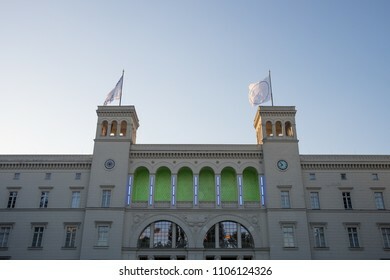 BERLIN, GERMANY - NOVEMBER 13, 2017: the Babylon cinema entrance photographed from Rosa-Luxemburg-Platz in the Mitte district of Berlin. 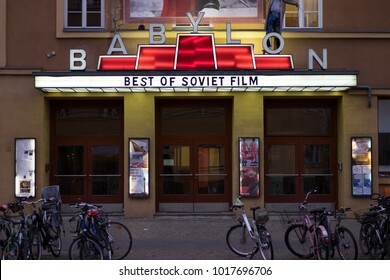 The Babylon is one of Berlin's best-known arthouse cinemas. 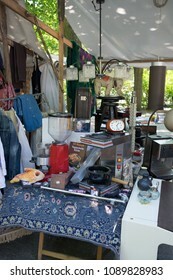 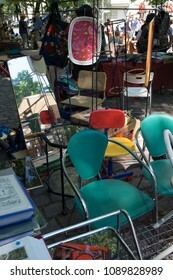 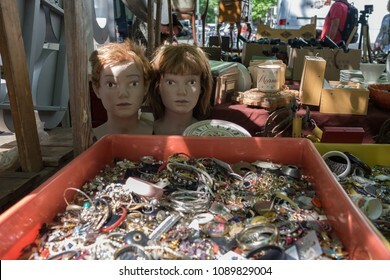 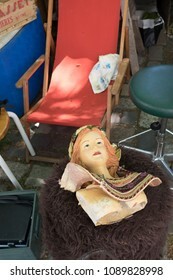 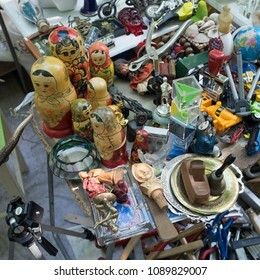 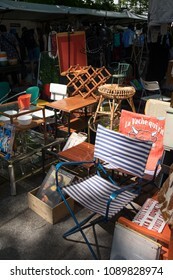 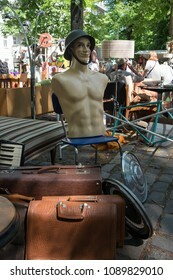 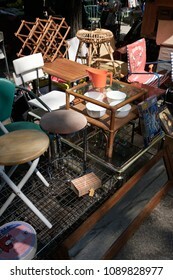 BERLIN, GERMANY - MAY 13, 2018: items for sale at the flea market at Arkonaplatz, in the Prenzlauer Berg district of Berlin. 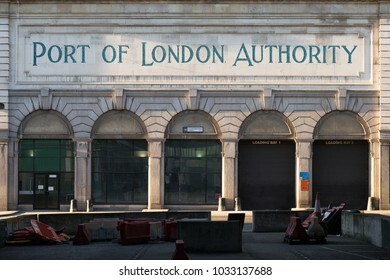 LONDON, UK - FEBRUARY 25, 2018: the historic Port of London Authority building, on Charterhouse Street in Farringdon. 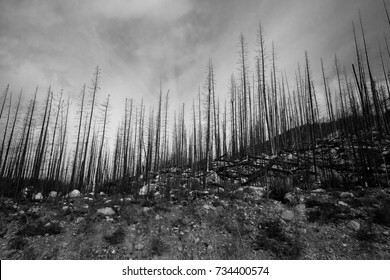 Dramatic black-and-white shot of forest-fire affected area in the Canadian Rockies. 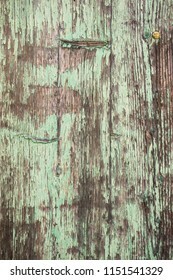 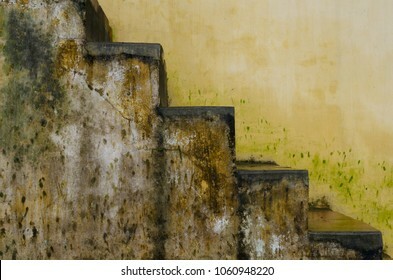 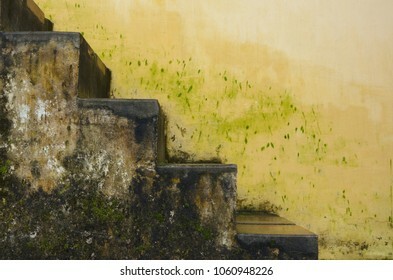 Weathered wooden surface with distressed paint. 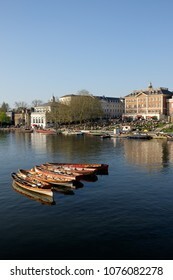 Scenic view of empty rowing boats anchored in the Thames at Richmond on a sunny spring day, with Richmond waterside prominent in the background. 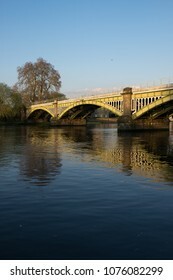 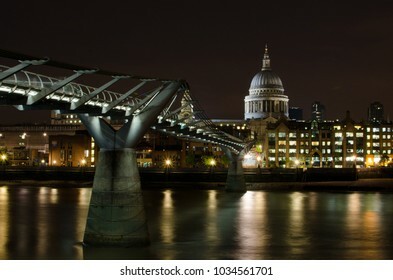 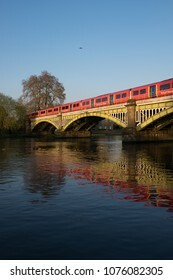 Richmond Railway Bridge reflected in the waters of the Thames. 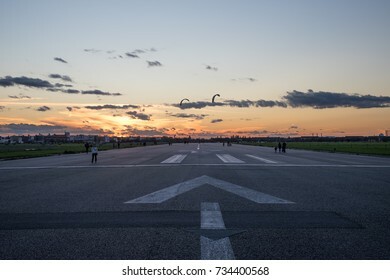 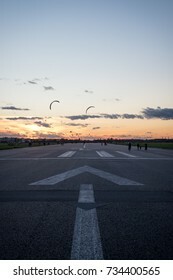 BERLIN, GERMANY - OCTOBER 8, 2017: people enjoying an evening stroll on the runway at the former Tempelhof Airport, now a public park in Berlin. 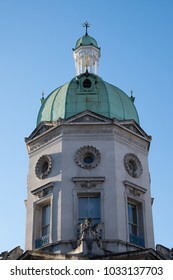 LONDON, UK - FEBRUARY 25, 2018: one of four towers marking the corners of the Smithfield Market building, designed by Sir Horace Jones. 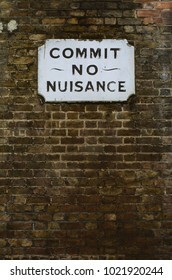 Historic sign in Southwark, London warning passers-by to 'commit no nuisance'. 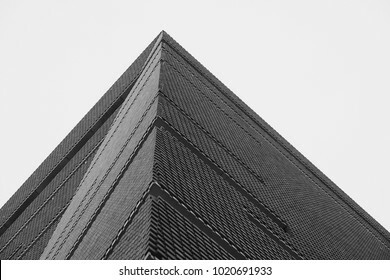 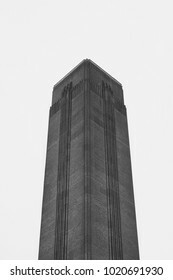 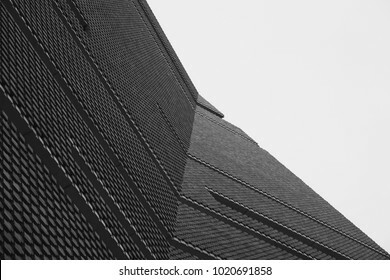 LONDON, UK - FEBRUARY 8, 2018: isolated shot of the chimney of the former Bankside power station building, now the Tate Modern art museum. 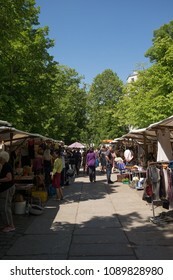 BERLIN, GERMANY - MAY 13, 2018: the flea market at Arkonaplatz, in the Prenzlauer Berg district of Berlin. 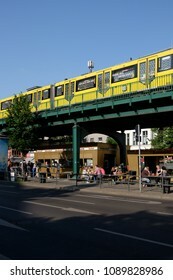 BERLIN, GERMANY - MAY 12, 2018: an U-Bahn (metro) train at Eberswalder Strasse station in Berlin's Prenzlauer Berg district, with the famous Konnopke's fast food stand visible below. 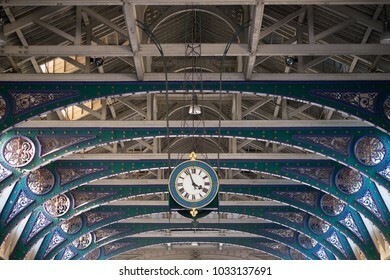 LONDON, UK - FEBRUARY 25, 2018: the cast iron roof arches of the Grand Avenue at the centre of the historic Smithfield Market building, designed by Sir Horace Jones. 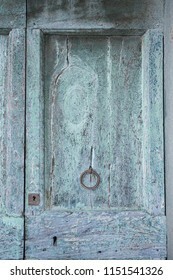 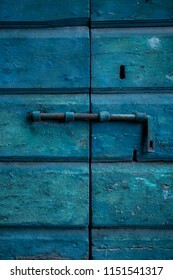 Weathered traditional wooden door with detail of rusty iron bolt. 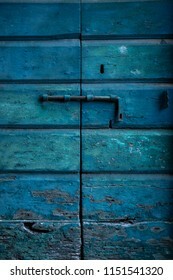 Weathered traditional wooden door locked with rusted iron bolt. 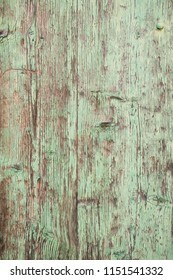 Weathered wooden panel with distressed paint. 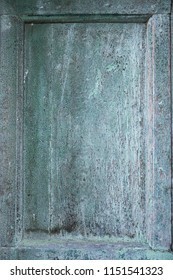 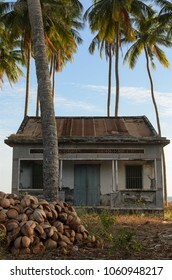 Weathered traditional wooden panelled door. 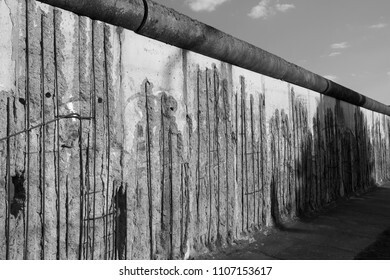 BERLIN, GERMANY - MAY 21, 2018: a section of the Berlin Wall at the memorial site on Bernauer Strasse, Mitte, Berlin. 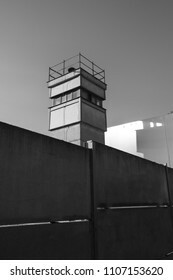 BERLIN, GERMANY - MAY 21, 2018: watchtower at the Berlin Wall memorial site on Bernauer Strasse, Mitte, Berlin. 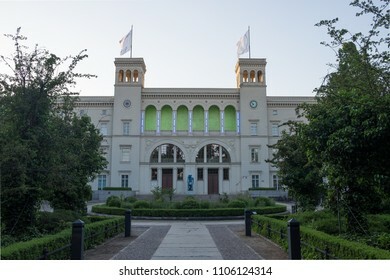 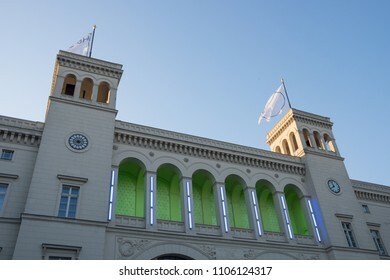 BERLIN, GERMANY - MAY 21, 2018: the Hamburger Bahnhof, a former railway station now converted to a modern art museum in Moabit, Berlin. 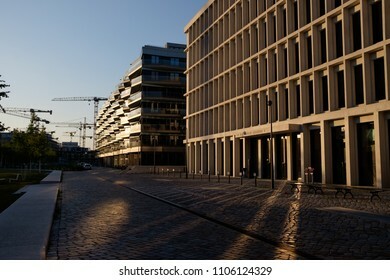 BERLIN, GERMANY - MAY 21, 2018: a new office and housing development near the Hamburger Bahnhof in Moabit, Berlin. 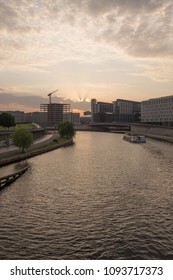 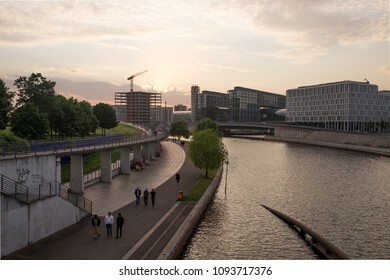 BERLIN, GERMANY - MAY 17, 2018: view of the River Spree in the government district of Berlin, with Berlin Hauptbahnhof (Central Station) in the distance. 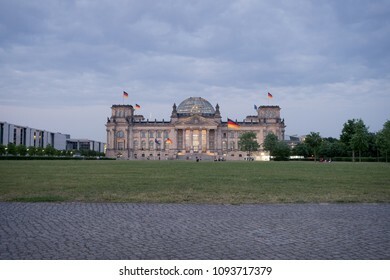 BERLIN, GERMANY - MAY 17, 2018: the Reichstag (the historic German parliament building, restored with new glass dome designed by Norman Foster), seen at dusk from Platz der Republik. 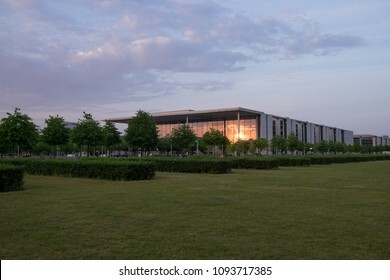 BERLIN, GERMANY - MAY 17, 2018: view of the Paul-Löbe-Haus designed by Stephan Braunfels, seen from the Platz der Republik at dusk. 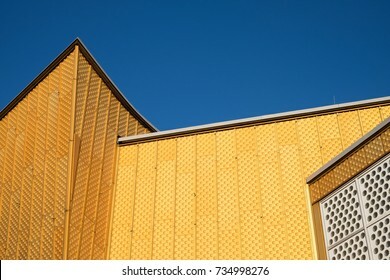 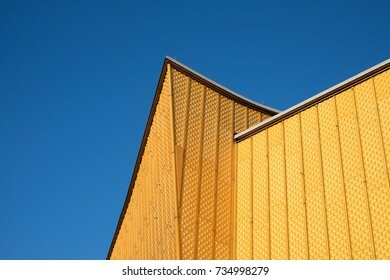 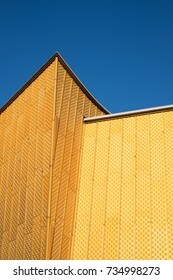 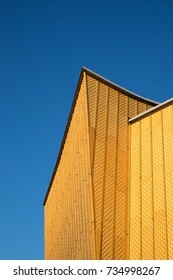 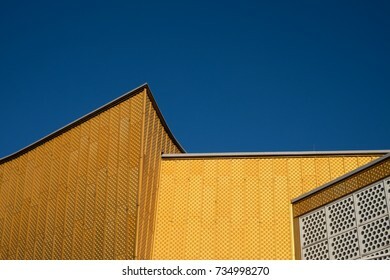 BERLIN, GERMANY - OCTOBER 15, 2017: detail of the striking roof design of the Chamber Music Hall (Kammermusiksaal) at the Berlin Philarmonie, designed by Hans Scharoun. 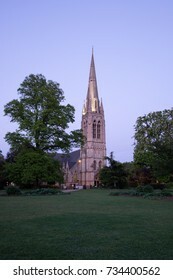 LONDON, UNITED KINGDOM - 26 APRIL 2017: view of St Mary's Church, Stoke Newington at dusk, seen from Clissold Park. 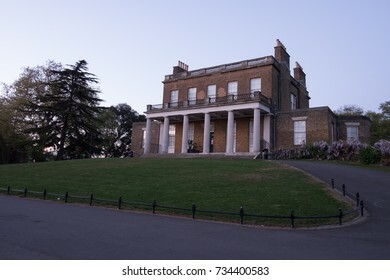 LONDON, UNITED KINGDOM - 26 APRIL 2017: view of The House at Clissold Park, Stoke Newington, at dusk. 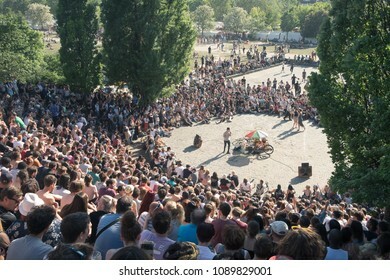 BERLIN, GERMANY - MAY 13, 2018: a large crowd watches open-air karaoke in the Mauerpark, in the Berlin district of Prenzlauer Berg, with the Berlin TV Tower visible in the distance. 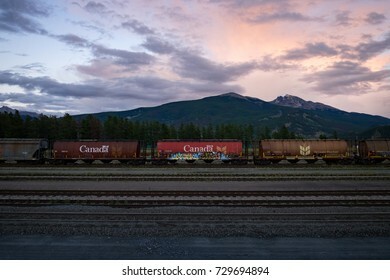 JASPER, CANADA - SEPTEMBER 5, 2016: view of the Canadian Rockies, with long line of rail cars in the foreground. 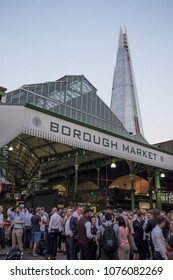 LONDON, UK - APRIL 19, 2018: crowds of people having after-work drinks at one of the entrances to Borough Market, with The Shard visible in the background. 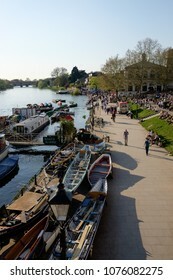 RICHMOND, SURREY, UK - APRIL 20, 2018: people strolling along the waterfront at Richmond on a sunny spring day. 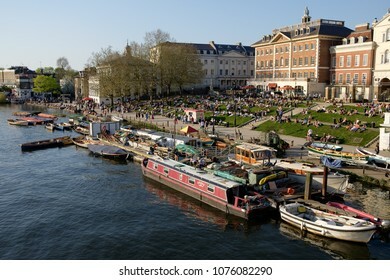 RICHMOND, SURREY, UK - APRIL 20, 2018: crowded waterfront at Richmond on a sunny spring day. 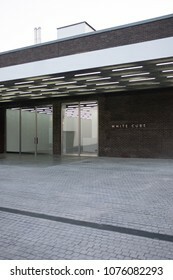 LONDON, UK - APRIL 19, 2018: the White Cube gallery in Bermondsey at dusk. 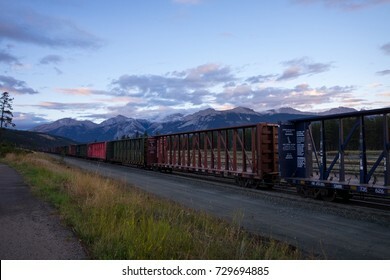 RICHMOND, SURREY, UK - APRIL 20, 2018: a Southwestern Railway train crossing the Richmond Railway Bridge. 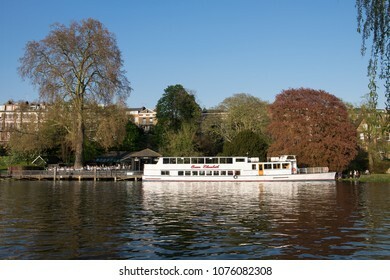 RICHMOND, SURREY, UK - APRIL 20, 2018: river cruise boat moored on the bank of the Thames at Richmond, with crowd of people nearby enjoying fine spring weather. 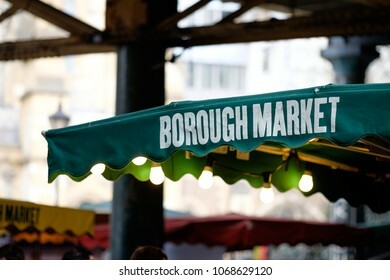 LONDON, UK - APRIL 14, 2018: awning covering one of the picturesque food stalls in Borough Market. 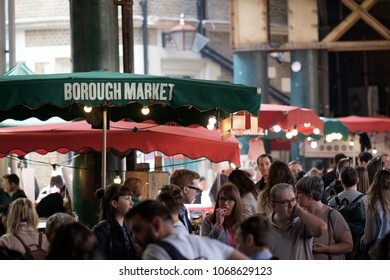 LONDON, UK - APRIL 14, 2018: busy interior of Borough Market on a weekend. 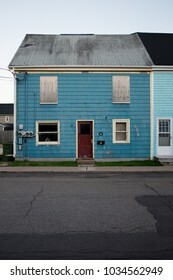 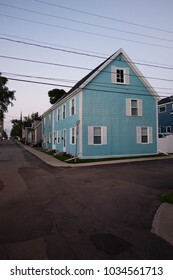 CHARLOTTETOWN, PRINCE EDWARD ISLAND, CANADA - AUGUST 23, 2016: boarded-up traditional wooden house. 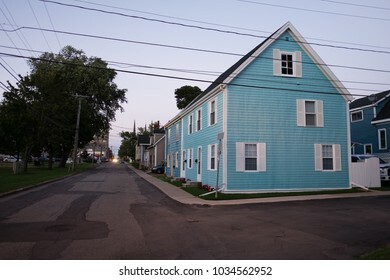 CHARLOTTETOWN, PRINCE EDWARD ISLAND, CANADA - AUGUST 23, 2016: picturesque traditional wooden house photographed at dusk. 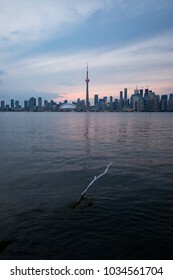 Toronto skyline at dusk, seen from Toronto Island. 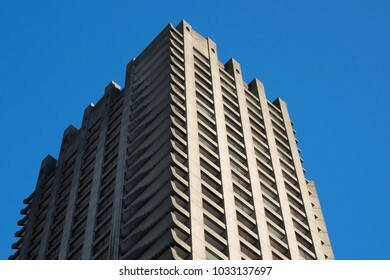 LONDON, UK - FEBRUARY 25, 2018: one of the towers at the Barbican Estate. 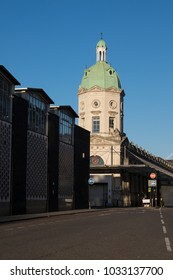 LONDON, UK - FEBRUARY 25, 2018: the Smithfield Market building, designed by Sir Horace Jones, in bright sunlight; in the foreground, the newer Smithfield Poultry Market building is visible. 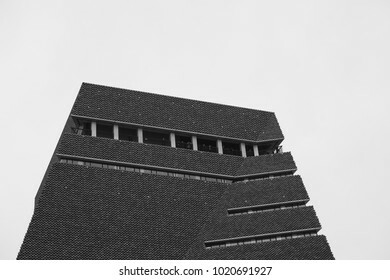 LONDON, UK - FEBRUARY 8, 2018: exterior of the Switch House extension to Tate Modern, designed by Herzog & de Meuron. 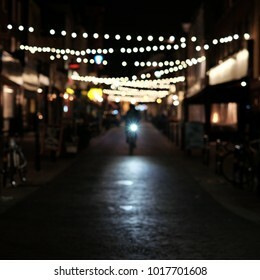 Cyclist riding down cobbled street in London with decorative lighting in background. 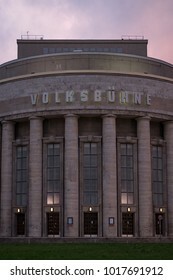 BERLIN, GERMANY - NOVEMBER 13, 2017: the Volksbühne ('People's Theatre') photographed from Rosa-Luxemburg-Platz. 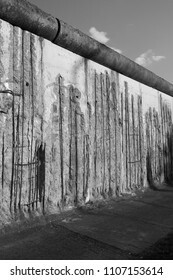 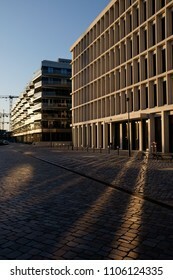 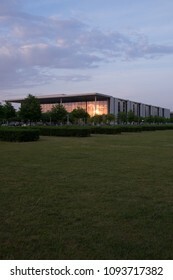 A key landmark in east Berlin. 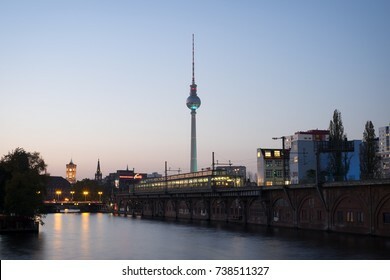 BERLIN, GERMANY - OCTOBER 16, 2017: Berlin skyline viewed over the river Spree, with Jannowitzbrücke S- and U-bahn station in the middle distance and the Fernsehturm (TV tower) in the distance. 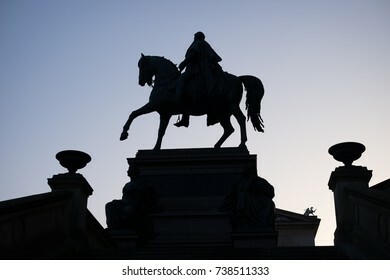 BERLIN, GERMANY - OCTOBER 16, 2017: bronze equestrian statue of King Friedrich Wilhelm IV of Prussia in front of the Alte Nationalgalerie (Old National Gallery), silhouetted at dusk. 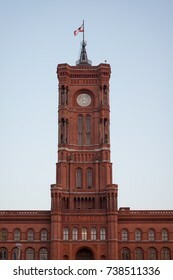 BERLIN, GERMANY - OCTOBER 16, 2017: Berlin City Hall (the Rotes Rathaus, literally the 'red city hall') viewed from Rathausstraße. 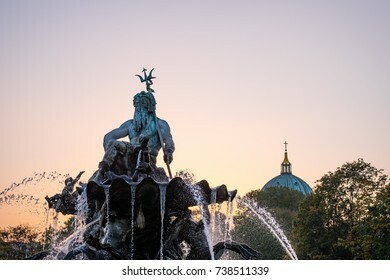 BERLIN, GERMANY - OCTOBER 16, 2017: the Neptune Fountain (Neptunbrunnen) in the Alexanderplatz area of Berlin, with the dome of the Berlin cathedral (Berliner Dom) visible in the background. 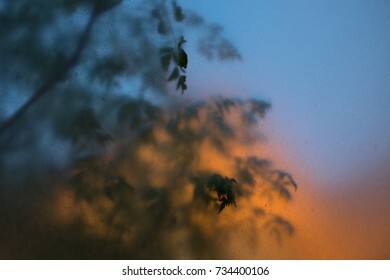 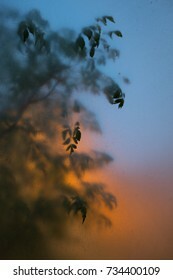 Leaves and Mediterranean skyline seen through sandblasted perspex. 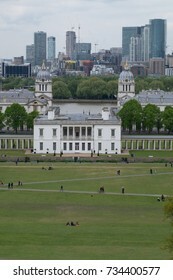 LONDON, UNITED KINGDOM - APRIL 29, 2017: view of Greenwich Park and the Queen's House, part of the National Maritime Museum, with the River Thames and the towers of Canary Wharf in the background. 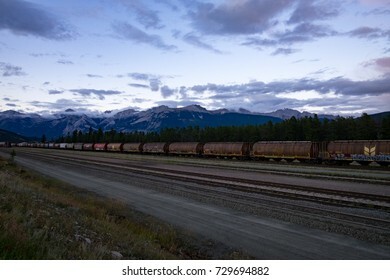 JASPER, CANADA - SEPTEMBER 5, 2016: view eastwards towards Signal Mountain and Mount Tekarra, with rail cars in the foreground. 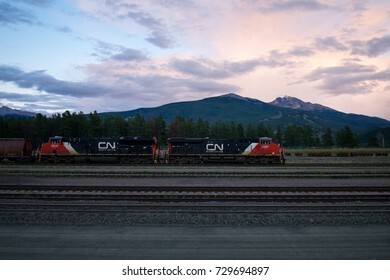 JASPER, CANADA - SEPTEMBER 5, 2016: view eastwards towards Signal Mountain and Mount Tekarra, with rail locomotive in the foreground. 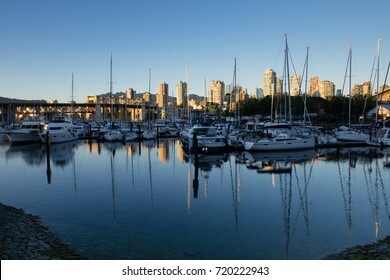 VANCOUVER, CANADA - SEPTEMBER 13, 2016: boats line the marina at Fisherman's Wharf. 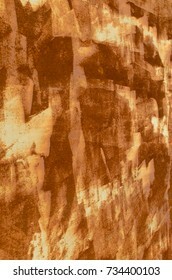 Granville Bridge and the Burrard Street Bridge are visible. 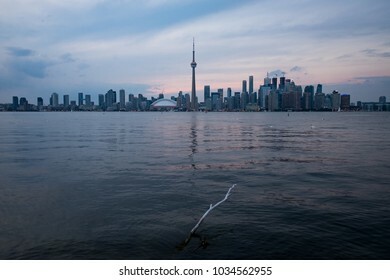 Vancouver skyline in background. 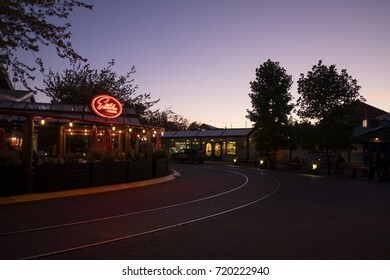 VANCOUVER, CANADA - SEPTEMBER 13, 2016: restaurants and shops line a quiet street in Granville Island at dusk. 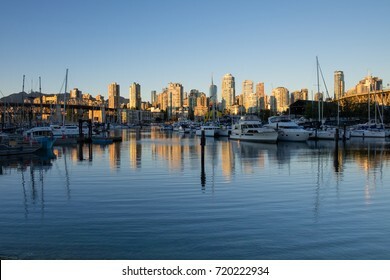 VANCOUVER, CANADA - SEPTEMBER 13, 2016: boats line the marina at Fisherman's Wharf between Granville Island and the Burrard Street Bridge. 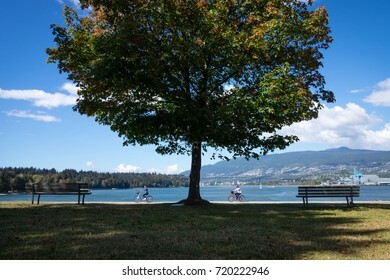 VANCOUVER, CANADA - SEPTEMBER 11, 2016: cyclists ride through Stanley Park past a tree just breaking into autumn leaf. 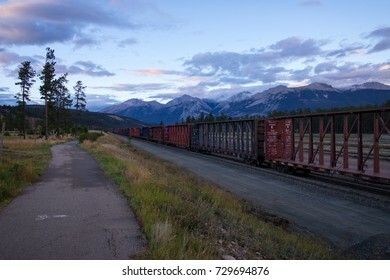 Lion's Gate bridge and North Vancouver are visible in the distance. 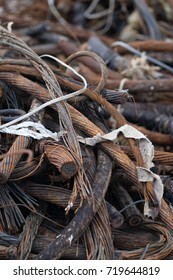 A pile of rusting steel cabling. 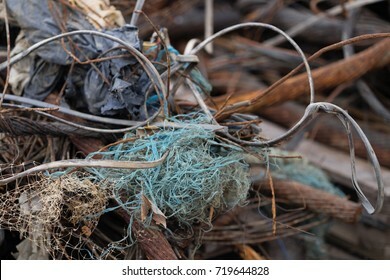 A clump of turquoise plastic fibres and other refuse materials intertwined with rusting steel cabling (portrait orientation). 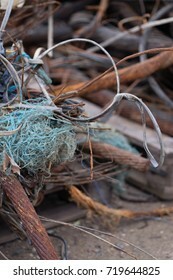 A clump of turquoise plastic fibres intertwined with rusting steel cabling (portrait orientation). 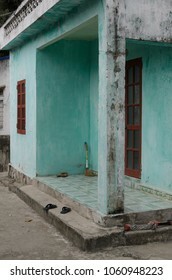 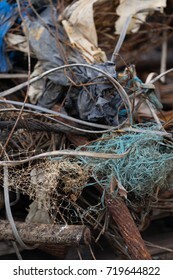 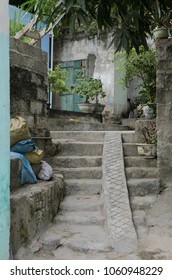 A clump of turquoise plastic fibres and other refuse materials intertwined with rusting steel cabling (landscape orientation). 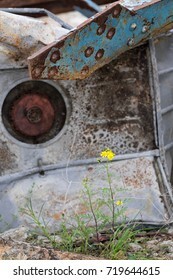 A pile of rusting steel with a small yellow daisy in the foreground. 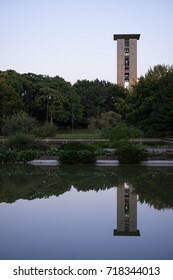 BERLIN, GERMANY - SEPTEMBER 18, 2017: view of the Carillon in the Tiergarten district of Berlin, mirrored in one of the reflecting pools in front of the Haus der Kulturen der Welt. 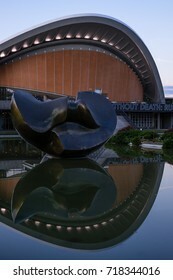 BERLIN, GERMANY - SEPTEMBER 18, 2017: the Haus der Kulturen der Welt (House of the World's Cultures), with the Henry Moore sculpture 'Large Divided Oval: Butterfly' prominently in the foreground.